The 24mm calibre was only used by the Swiss, in the automatic-loading Pzw Kan 38 (Panzerwagenkanone 38) light AFV weapon, which used a powerful 24 X 138 cartridge. This was another of the Furrer designs, utilising a short-recoil toggle-bolt mechanism. Neither France nor the Soviet Union developed 20mm AA guns, both preferring to use larger-calibre weapons of 25mm, while Germany went to the 30mm calibre late in the war in the search for more power. The attraction of these larger calibres was their greater range, with a practical ceiling (depending on the speed of the aircraft being engaged) in the region of 3,000m instead of the 2,000m achieved by 20mm equipment. Despite the similarity in calibre, the French and Soviet 25mm guns used quite different cartridges and gun designs. During the 1920s and 1930s Hotchkiss conceived the need for lightweight anti-aircraft and anti-tank weapons with appreciably more hitting power than the 20mm calibre could achieve but with more mobility than the 37mm guns. The 25mm calibre was selected and, rather surprisingly, two different cartridges were introduced. The larger of these was the 25 X 194R for the manually loaded Mle 1934 anti-tank gun (a shortened cavalry weapon - the Mle 1935 - and the lightweight Mle 1937 were also designed to fire this round). This was a powerful cartridge firing a 320g projectile at up to 960 m/s, producing more than double the muzzle energy of the most powerful contemporary 20mm cannon, the 20 X 138B Solothurn. There was no doubt that the Hotchkiss, which was also fitted to light armoured vehicles, was effective against most mid-1930s tanks, although it was of course soon outclassed by the growth in tank armour thickness. The British Army did acquire some in 1939 and although they were used mainly for training some saw active service in France and Norway. They were not popular, however, because of their marginal effectiveness (by then) and fragility when being towed. 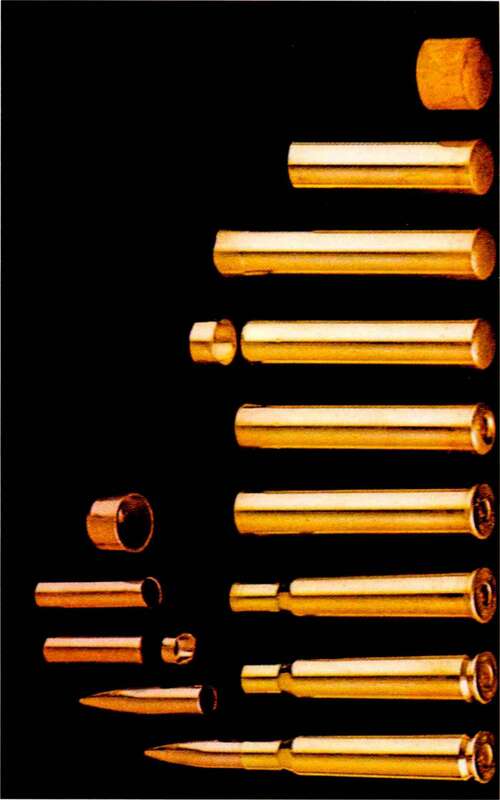 For the anti-aircraft weapon Hotchkiss developed a different cartridge, the rimless 25 X 163, used in the fully automatic Mitrailleuse de 25mm suv affut universeI Hotchkiss. By the start of hostilities this was available in two versions with different mountings, the Mle 1938 and Mle 1939, weighing 950kg and 1,150kg respectively. As described in Chapter 4, this gun was also adopted by the Japanese Navy in various mountings. The Soviet 25mm AA guns were based on a Bofors design and used the 25 X 218R M1940 cartridge (slightly different in shape from the Bofors m/32 round). Their entry into service was delayed by the higher priority given to the development of the 37mm Model 1939, which used a similar mechanism. The 25mm gun was carried on a four-wheel platform, the combination weighing 1,073 kg. There was also a twin-barrel version carried on trucks. The German 30mm equipment was the 3cm FlaK 38, which was simply the MK 103 aircraft cannon fitted to the 20mm FlaK 38 mounting. This was a powerful weapon, using a big 30 X 184B cartridge, and the belt-fed gun had an impressive rate of fire. The problem was that the 2cm mounting was not really sturdy enough for the job, giving rise to vibration and unreliability. The 3cm FlaK 38 was introduced in 1944 and only saw service in small numbers. The gun also featured in a remarkable prototype SPAAG (self-propelled anti-aircraft gun), the Leichter Flakpanzer IV 'Kugelblitz' (Ball lightning), in which two MK 103s were contained within a ball mounting, shared with the commander and two gunlayers, and mounted on a PzIV tank chassis. Only five were made. Once again, the Swiss chose an odd calibre for the largest of the Furrer designs, the water-cooled 34mm Flab Kan 38 A A gun, which used a powerful 34 X 239 cartridge. This remained in service until 1968. In contrast, the 37mm calibre was extremely popular, with a wide range of ammunition being developed for aircraft, anti-aircraft, tank and antitank weapons. 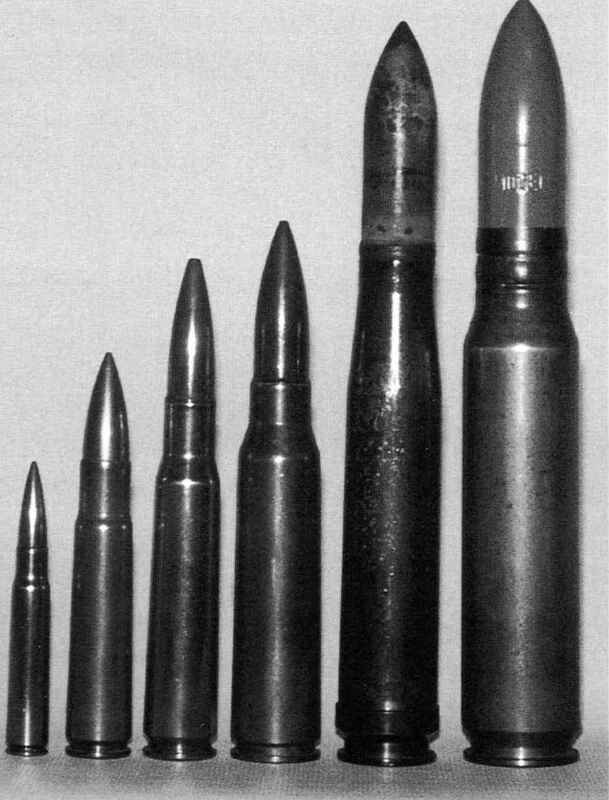 The Japanese used six different 37mm cartridges during the Second World War, and the French, Germans and Americans at least three each (all different). At the bottom end of the power scale, the original 37 X 94R ammunition from the nineteenth century Pom-pom was still in service, mainly in French light tanks. At the other end of the spectrum came the immense 37 X 380R SK C/30 German naval weapon. Both of these guns were manually loaded, however. The range of automatic weapons was much more restricted. In army use, 37mm automatic weapons were intended solely for AA purposes. Guns in this calibre were developed in and employed by the USSR, the USA, Germany, France and Italy. Of all the major powers, only Japan and the UK did not develop automatic 37mm AA weapons. The calibre was popular because it was almost the largest for which fully automatic weapons could be designed at the time, and the shells were big enough to stand a reasonable chance of knocking down an aircraft with one hit. The 37mm guns therefore provided an important layer in AA defence with an effective ceiling of up to 3,500m, in between the light cannon and the larger, manually loaded guns of 75mm and more. emerged in 1935, was considered too cumbersome vehicles in order to provide air defence to armoured columns. Some were open in action, providing little protection for the crew, but the best known was the turreted vehicle with the impressive title Flakpanzer IV 3.7cm FlaK 43 auf PzIV/3 'Ostwinclbased on the ubiquitous Panzer IV chassis. Few were built before the end of the war. Despite developing the intermediate 25mm Hotchkiss, the French had earlier produced a 37mm AA gun, the Schneider Ml930. Little information is now available about either the gun or the ammunition, but they can be presumed to have been unsuccessful as only about twenty were in service by the start of the Second World War, participating in the defence of Paris. The equipment is quoted as weighing 1,800kg in travelling order, 1,340kg in action. 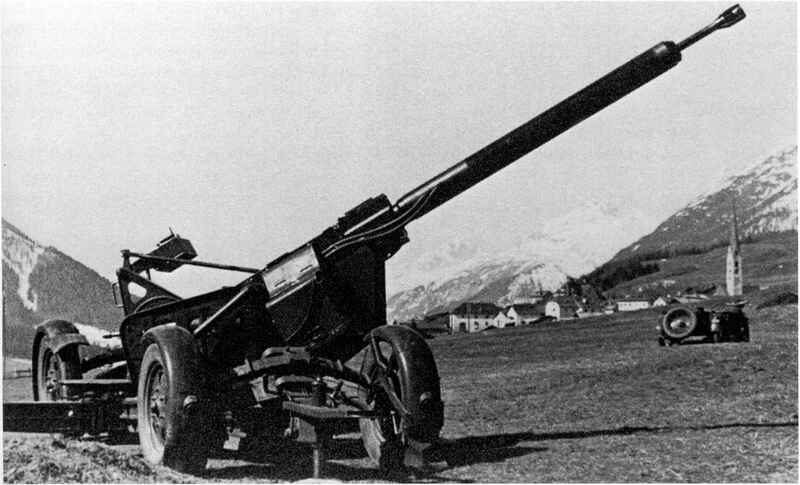 The Italians also produced a weapon of this calibre, the Cannone-Mitragliera da 37154 modello 39, a Breda design firing a 37 X 230SR cartridge. It was unusual in being designed for fixed defences, presumably accounting for its substantial weight of 2,975kg, but the exigencies of war forced the adaptation of some of the guns to mobile mountings. The Soviet 37mm Ml939, as already indicated, bore a strong resemblance to the 40mm Bofors and differed principally in using a smaller and less powerful 37 X 250R cartridge. The travelling weight on its four-wheeled mounting was 2,100kg. The American 37mm Gun Ml, chambered for a at over 3,600kg (1,750kg in action) and it was soon 37 X 223SR cartridge, was generally similar, but on replaced in production by the FlaK 36, with the paper at least somewhat inferior in rate of fire and weight reduced to 2,400kg/l,550 kg. The FlaK 37 was a modification of the 36 to take a new mechanical computing sight. stacked and weighed 2,800kg in action, compared dard US (manually loaded) tank and anti-tank gun with 1,250kg for the single-barrel model. As with the 2cm weapons, German 3.7cm guns found themselves fitted to a variety of armoured at the start of the war used a 37 X 223R cartridge which was almost identical to the AA round except for the rimmed case. 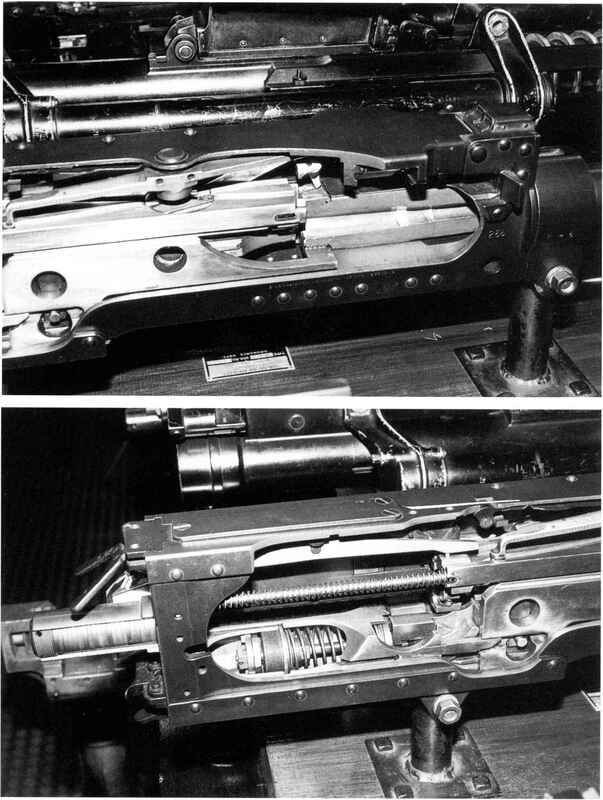 Did british ww2 forces use the browining .30 machine gun? How to draw world war 2 guns?